The Seaport restaurant Chickadee features a menu inspired by the Mediterranean. 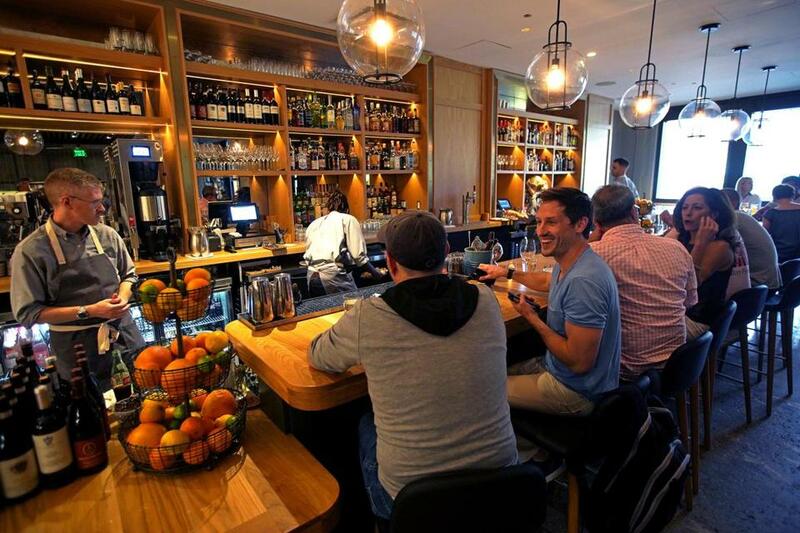 Where to Chickadee, a Seaport restaurant from chef John daSilva and beverage director Ted Kilpatrick, located in the Innovation and Design Building. It’s named for the Massachusetts state bird. What for Lunch, dinner, and drinks from an all-star team. Kilpatrick and daSilva met working at No. 9 Park. You may also know daSilva from Spoke Wine Bar; Kilpatrick most recently has been in New York, opening restaurants with the O Ya folks. Chef de cuisine Stef Bui also worked at No. 9 Park, as well as Deuxave. The scene A warmly lighted, open space of black, white, and wood, the kitchen visible at the back. Friends run into one another at the L-shaped bar and wind up sharing whole golden heads of fried cauliflower draped in labneh ranch dressing, crab gratin with puffed rice crackers, and porchetta with watermelon and fried peanuts. Others gather at high-tops. Sleek subway tile and white columns painted with black lines are offset by the warmth of flowers, potted plants, and oak surfaces. What you’re eating The menu is inspired by the Mediterranean. At lunch that means dips and salads, pita sandwiches — spicy cauliflower with fermented cabbage, Swiss, and harissa mayo; fried hake with pickled peppers and zhoug — and main courses like chicken meatballs with smoked almond, grape, jicama, and mint. At dinner, you might find sour cream and onion doughnuts with caviar and crème fraiche, spiced lamb tartare with kohlrabi tzatziki, bigoli with littleneck clams and green harissa, or dry-aged sirloin with fattoush, black plum, halloumi, and tomatillo. Dessert brings blueberry trifle, tahini affogato, and more. Care for a drink? There are three New England beers on tap, more in cans and bottles, and plenty of fun and interesting wines by the glass. The house cocktails avoid the usual: Think things like the Goldfinch, a gin and tonic made with golden beets, or the Colima, tequila with snap pea, lime, gruner veltliner, mint, and soda. Overheard Confusion about parking, stranger-to-stranger banter, porchetta-gasms. “It’s like a word problem,” a woman exclaims to her barmates regarding the parking signs in the lot. A new arrival pulls up a stool. “Welcome to our end of the bar,” says his new neighbor. “I work in the building,” he says. “I’ve already been here a few times.” Someone takes a bite of cauliflower. “Oh my God, it’s delicious,” she says. “It looked even better before we ate most of it,” one of her companions confesses.